As a water sign in astrology, Cancer zodiac sign people are known to be ruled by their emotions. This is why Neptune in Cancer follow their instincts on everything, no matter what the inspiration for it. While some may see their actions as illogical, those closest to them know they are only acting on feeling. (Take the psychic reading to know how intuitive you are). Neptune is symbolic of intuition, spiritual awakening, beauty, drama, fantasies, and illusions. 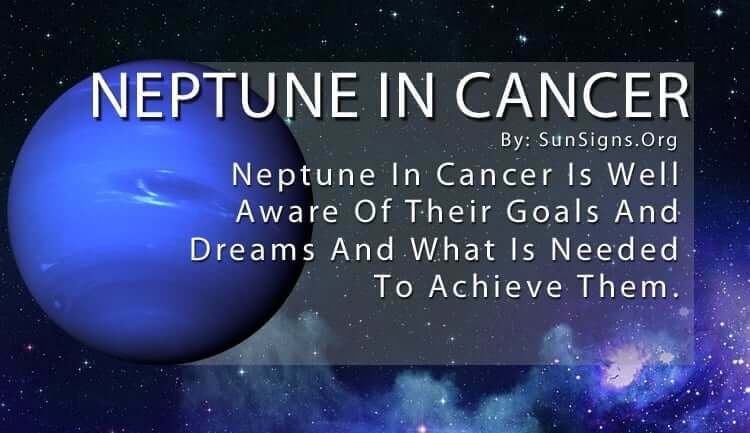 Because they are so in-tune with their emotions, Neptune in Cancer is well aware of their goals and dreams and what is needed to achieve them. The only problem is they can get too caught up in the ideal version of these dreams which can make them unattainable. (This is characteristic of the Cancer man or Cancer woman). Sometimes reality gets to be too much for them and they would rather shy away from conflict than deal with it head-on. Just like the crab that symbolizes their star sign, they tend to hide out when things get rough and wait for the dust to settle. They can be too involved with a fictional scenario to see that their goal is achievable, as long as they look at it in realistic terms. While they are incredibly intuitive to other people’s feelings and needs, they sometimes have trouble dealing with their own. The Neptune in Cancer person makes a great counselor. (Take a career astrology reading to know the most suitable job for you). They can empathize with the longing some people experience when things aren’t going their way, and they are great at giving advice. Their inspiration comes from helping others and feeling needed by their loved ones. They feel at-one with nature when they are at home, peacefully enjoying the cozy environment they have created for themselves and their family. Family is very important to them, as is keeping tradition alive. (Get dating ideas that include kids). The Cancer Neptune sign people sometimes feel lost when things change within their social circle, for they want everything to stay the same. They grow comfortable with a certain situation and specific people, and they want to maintain that status for as long as possible. This means Neptune in Cancer sometimes try to manipulate things so that they end up in their favor. But that’s only because they are so committed to the way things are. They are never malicious in attempting this kind of control. (Know more about your Neptune sign personality). They simply can’t stand it when things aren’t the way they feel they should be to maintain security. This is where they can become confused or depressed because they put forth so much effort to keep things stable. The one thing Neptune in Cancer needs to work on is their obsession with illusion. It’s difficult for them to feel completely happy all the time because reality constantly presents them with negative situations. This is when they strive to create the ideal home, ideal relationships, and ideal life. They believe they can’t reach true enlightenment until they have achieved all of this perfection, which is why they are prone to emotional outbursts when things don’t work out their way. Neptune in Cancer can be too sensitive when it comes to certain aspects of their lives, and that’s what keeps them from moving forward. But if they are able to concentrate on smaller goals and focus on completing one thing at a time, they may find it easier to deal with the changes that life throws at them. It won’t seem so overwhelming, meaning they will appear to have more control. And that is a great boost to their confidence. (find out which planets in signs can influence your emotions).